Send to target followed by a directed cone exercise. The dog is sent straight ahead to a target and is then directed either left or right around the outside of a cone. The exercise is performed twice, once with the dog returning to front position and once directly to heel position. Purpose: Demonstrate distance control, directional understanding, and precision obedience skills. Equipment: Target/cone/vertical pole, foot target or platform for the send portion, and two additional cones. Exercise set-up: A cone/target/platform, etc. is placed at a 20-foot (6 m) distance from the starting point. Additional cones are placed 7-10 ft. (2.1–3 m) to the left and right of mid-line, halfway between the dog and the handler (creating a diamond shape). The exercise begins when the dog is sent straight ahead with a verbal and/or signal to the target object 20 ft. (6 m) away. After reaching the cone/target/platform, the handler has the option of cuing a stationary behavior (ex. sit, wait, down, etc.) or may continue without stopping. If a position is cued, it will be judged. The dog is then directed either left or right (verbal and/or hand signal) around the outside of the cone and returns to the handler. 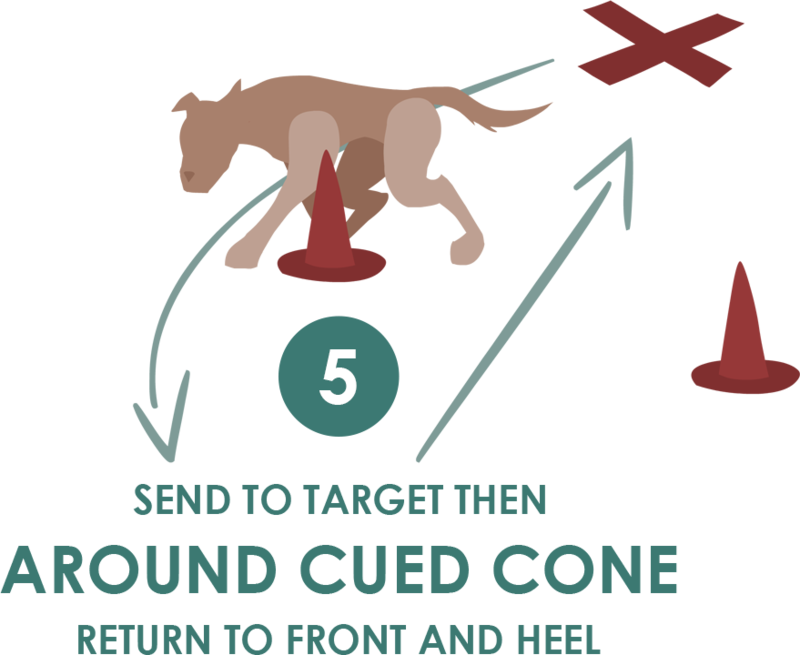 As the dog circles the cone, the dog is directed to either find heel position or find front position and must return directly to the correct position in either a sit or a stand. The handler may not pivot to face the dog. The handler may praise the dog after completing the first exercise. The exercise is repeated with the opposite cone, cuing the alternate position behavior as the dog returns around the cone. The dog must find the correct position and be close (within 6 inches) and straight (within 30 degrees) to the handler. The exercise ends when the dog has shown two repetitions of the behavior – one to heel and one to front position. Non-qualifiers: The dog does not go directly to the target. The dog is cued to a position on the target and assumes a different position. The dog does not go directly right or left around the cone as directed. The dog does not take the correct front or finish position, as directed, upon return to the handler. The handler holds the directional signal to go around the desired cone for an excessive amount of time. The handler holds the front or finish cue after the dog circles the cone. The handler moves his/her feet at any time after the exercise begins. Video does not permit the exercise to be adequately judged. Tip: Be careful not to hold your signal to send around the correct cone. You may also not hold your signal to call your dog into front or heel position – signal as the dog comes around the cone and return to neutral! If your dog goes out to the platform and stops, consider proceeding directly without a position cue so that it will not be a judged element.